NEW DELHI, India — It's a story India has heard before: A once-great family rules for generations until it degenerates into corruption and empty hubris. In the 17th century, Mughal emperors created the world’s richest empire and built India’s most famous monuments, including the Taj Mahal. Their heirs overstretched themselves and were ruined by decadence and in-fighting. Mughals remained on the throne while corrupt advisors bickered in an ever-shrinking kingdom until the edifice collapsed. The Gandhi family’s heirs — matriarch Sonia Gandhi, her son Rahul and daughter Priyanka — seem determined to follow the same path with their own empire, the Congress Party. Rahul’s great-grandfather, Jawaharlal Nehru, was Mahatma Gandhi’s political partner in the struggle for independence in 1947. His grandmother Indira Gandhi sculpted the political landscape with programs to lift the rural poor out of poverty while ruling India with an iron fist. Father Rajiv led Congress to its biggest ever election win in 1984, after Indira Gandhi’s assassination. Last week, Rahul led the party to its worst-ever election defeat. Their opponent, Narendra Modi, obliterated Congress. His Hindu nationalist Bharatiya Janata Party won 284 seats, its highest-ever total and enough to enjoy a commanding majority in India’s 543 seat parliament. Congress, in contrast, could win only 44, taking just a 19 percent share of the national vote. The party has never before secured fewer than 114 seats or won the votes of less than a quarter of Indians. This time, it didn’t even win enough seats to be named the official opposition. A major factor in the election was Modi’s unrelenting mockery of Rahul Gandhi, who spearheaded the Congress campaign. The BJP candidate lampooned his rival as the “shahzada,” an Urdu word meaning "crown prince" and a clear allusion to the Mughals. Modi’s nickname clearly rankled the Gandhis and resonated with Indians, who complained about corruption, economic mismanagement and stagnation during the Congress-led coalition government. Rahul became an electoral liability for Congress. While Modi was the BJP’s official candidate, Congress did not even commit to backing Rahul as prime minister if they won. Nonetheless, on polling day it was clear that Indians had rejected him. In the constituency of Amethi, which was held by his father Rajiv, Rahul scored a much-diminished majority. Even after the results were announced, when Rahul faced TV crews to proclaim he would “take responsibility” for doing “pretty badly,” he managed to strike a wrong note by smiling for the cameras. Leaders who steer their followers into electoral oblivion usually retire or wilt under the pressure of a younger, more vigorous challenger. Naturally, everything is different in India. Not only have neither Rahul nor Sonia shown any signs of wanting to stand down from their positions as vice president and president of the party, senior Congress officials have made it clear that far from mounting a leadership challenge, they would not allow the Gandhis to leave. At a special meeting on May 19, the Gandhis faced the rest of the party leadership to discuss their future. Sonia Gandhi and Rahul both offered to resign, but did not push the point when the resignations were rejected. In the days leading up to the meeting, Congress MPs toured TV newsrooms, begging them on air to stay. Kamal Nath, now the most senior Congress MP in the Lok Sabha, India’s lower house, blamed the former prime minister, Manmohan Singh, even though he was standing down from his post and had been repeatedly criticised by Rahul Gandhi. “I think it’s very impressive that both the Gandhis stepped up and took responsibility as leaders should, for what happened on their watch. The buck stops with them,” he said. But Tharoor wasn’t about to announce his candidacy as leader. On the contrary, he pointed out that Congress had won elections in 2004 and 2009 after defeats in the 1990s. “So we certainly would want to see her and Rahul-ji taking the right steps to rejuvenate, revive and restructure the party so that we can aim for victory five years’ from now,” he said. Would a younger MP decide to run in the 2019 elections? When 43-year-old Congress MP Jyotiraditya Scindia, a maharaja’s son, was interviewed by CNN-IBN, he mentioned “introspection” and a “pall of gloom” over Congress’s performance. But the views of Congress leaders don’t seem to be shared by everyone in the party. After the election results, party workers stood outside the Delhi headquarters chanting the name of Rahul’s sister, Priyanka Gandhi-Vadra. She looked as if she had given Congress a late boost in the final weeks of the campaign, taking on Modi and briefly compelling the BJP juggernaut to respond to her criticisms of the Gujarati chief minister. Would she make a better leader? Priyanka has a major electoral millstone: her husband, Robert Vadra, a property magnate who is facing allegations that he used his wife’s family connections to turn himself into a multi-millionaire. Priyanka says the allegations are an attempt to smear her family, and her husband denies them. So why are Congress officials so reluctant to let go of the Gandhi family? One answer lies in Indian history. Congress was formed in the 19th century to oppose British rule. Its first leader, Jawaharlal Nehru, worked alongside Mahatma Gandhi to provide the political muscle to persuade the British to quit India, and he is revered by many Indians. Jawaharlal Nehru, newly elected president of the All India Congress, talkis with Mahatma Gandhi in 1946. Nehru was prime minister for 17 years after independence and set the agenda for India’s development: using the state’s resources to try to lift all parts of India out of poverty. His daughter, Indira Gandhi, dominated politics for two more decades until her assassination in 1984. Her son, Rajiv Gandhi, looked set to continue the family tradition for decades longer until he was killed while campaigning in 1991. 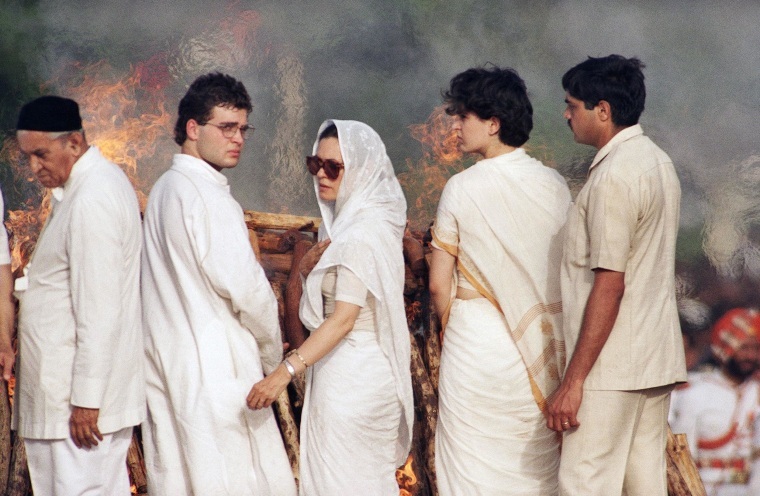 Afterward, Rajiv’s widow, Sonia, was thrust into the center of power by the other Congress leaders. Sonia’s Italian background has forced her to rule from behind the scenes. Having a “foreign” prime minister would have reminded too many Indians of their colonial past. When Congress won the 2005 election she stood down and gave the job to Manmohan Singh but he was widely viewed as a cipher, taking her instructions. All the Gandhis have followed Nehru’s lead. The party’s ideology was independence for the benefit of all Indians. That vagueness has given the party flexibility, but also means it’s hard for Indian voters to know what they stand for. Modi’s message of successful development in Gujarat could not be countered by anything Rahul Gandhi said. The MPs who have hitched their star to the Congress bandwagon have done so because they viewed it as a route to power. There’s a risk, articulated in private by Congress supporters, that without the Gandhis, nothing would hold the party together at all, and it would disintegrate. This is all good news for Modi. He has set out his stall to win a second election in five years’ time and will either face a man he has humiliated once already, or a splintered opposition. And Indians can be sure there will be no Modi dynasty. He has no children.